The polar bear eats the penguin? Nothing happens as the penguin is not delicious for the polar bear? Exactly this question one of our biology professor asked us in the first semester. Polar bears live in the Northern and penguins in the Southern hemisphere! That also means that polar bears are no threat for the penguins in South Africa. But which penguins in South Africa are there? In South Africa lives the African penguin (Spheniscus demersus) also known as jackass penguin because of its donkey-like vocal expressions. There are three more penguin species (Humboldt penguin, Galápagos penguin and Magellanic penguin) that also belong to the same genus, the banded penguins (Spheniscus). African penguins are the only breeding penguins in South Africa. Thus, they cannot be confused with the similar-looking Humboldt, Galápagos or Magellanic penguins of the same genus. 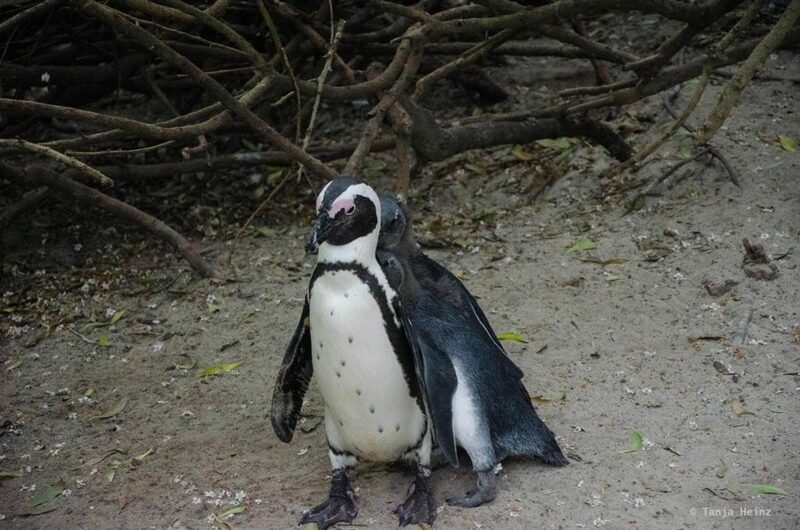 The African penguin is a medium-sized bird that reaches a size of about 60 to 70 centimeters. 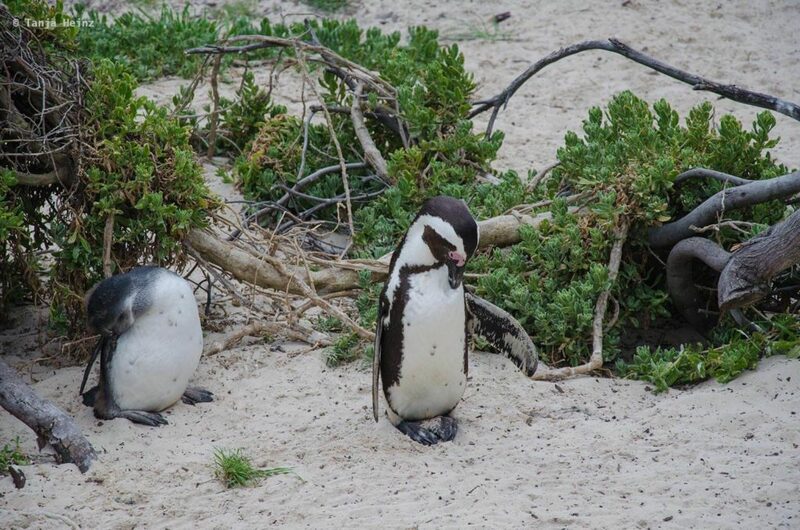 Penguins in South Africa (but also other penguins) breed in colonies. That means they live in a big group where they rear their offspring. Every pair builds a nest in burrows or other shallow hollows – preferred close to shrubs or boulders in order to protect their nests from the weather. Clutch size of African penguins is usually two. But both females and males incubate their eggs for about 40 days. Parents do not leave their offspring alone after hatching. Following hatching parents continue to protect their offspring and provide food for them. However, sometimes they leave their chicks alone for some time in order to catch some food. After 60 to 130 days the young develops juvenile plumage and leaves the colony. Then they will catch food for themselves. 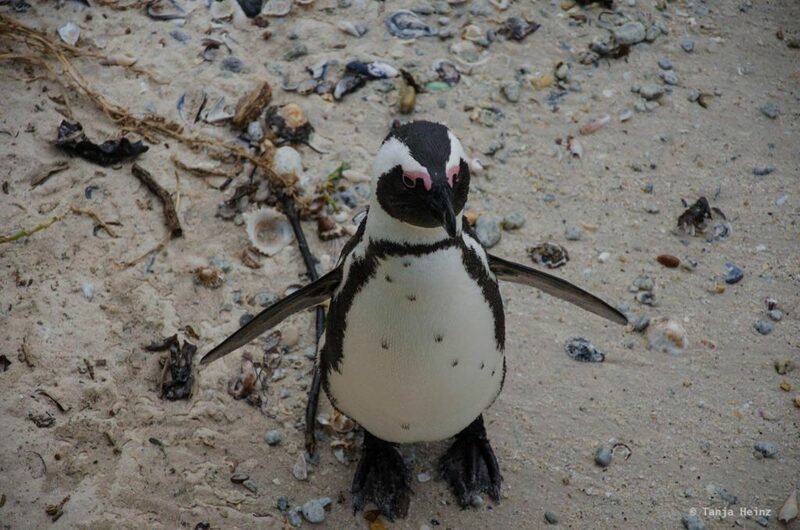 The favourite food of African penguins is anchovies (Engraulis capensis) and sardines (Sardinops sagax). African penguins are like other penguins perfectly adapted to a life in the water. They have a waterproof plumage which they continuously clean with a waxy substance from the preen gland of the tail. This waterproof coat keeps them warm when searching for food in the ocean. During an oil catastrophe the warming function of their waterproof plumage is destroyed. 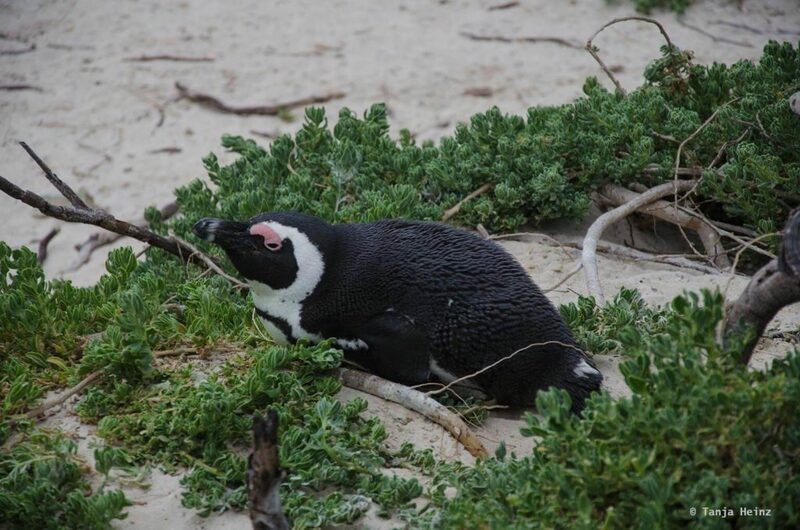 Therefore it is important that organizations like the SANCCOB exists to save penguins from oil catastrophes and release them after cleaning again into the wild. 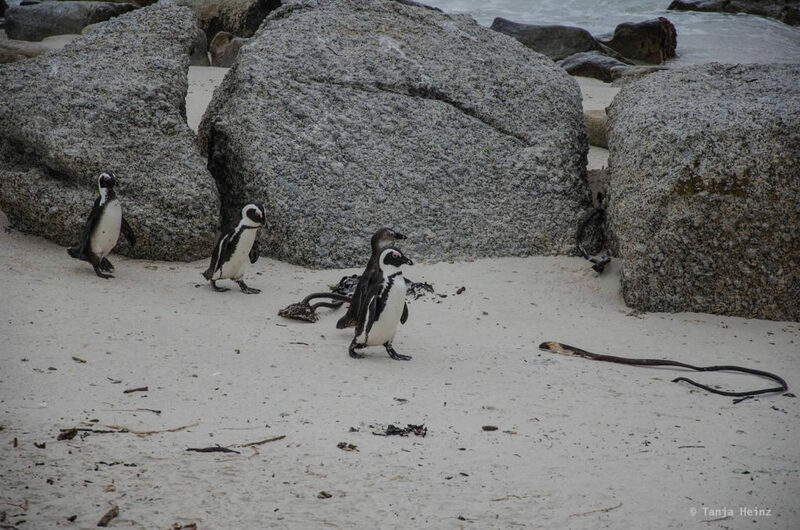 However, there are some more threats to the African penguins. 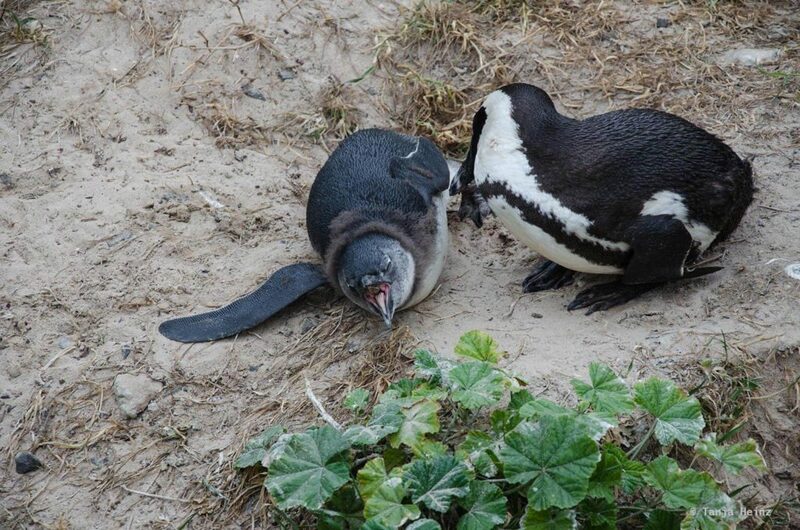 In the past collection of eggs and disturbance while taking the penguin’s guano for fertilizers were their main threats. 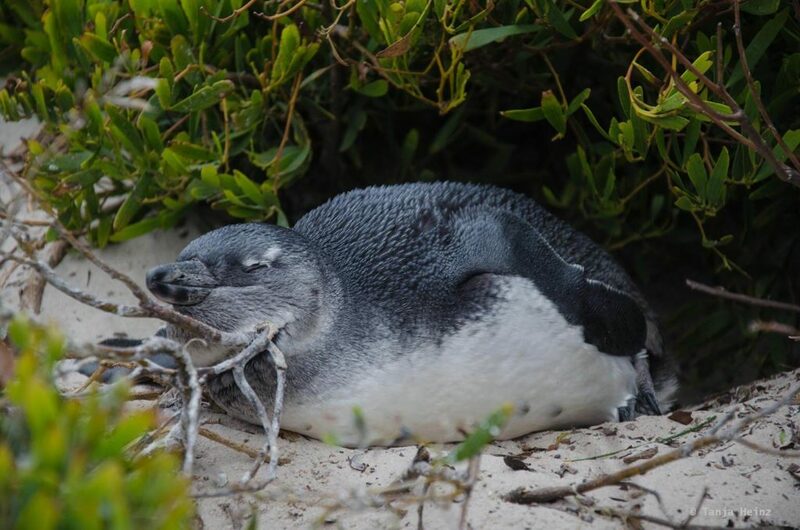 Nowadays African penguins mostly suffer because of over-fishing, and thus, food shortage. 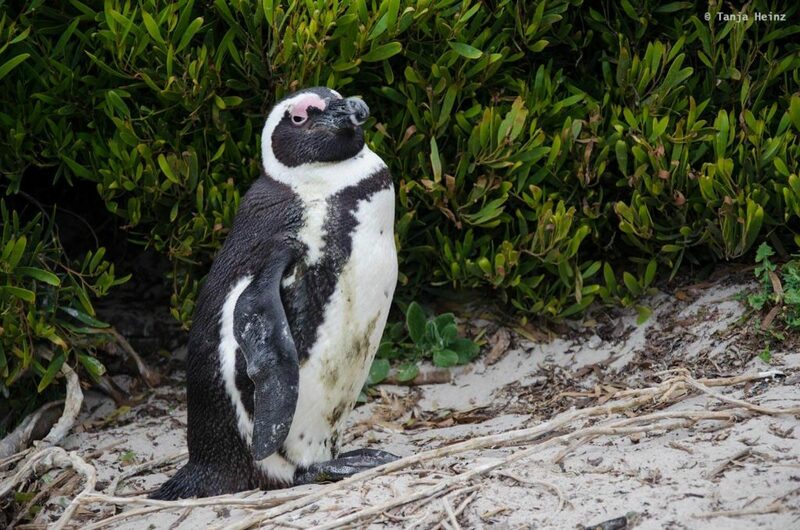 According to the IUCN the African penguin is „endangered“. 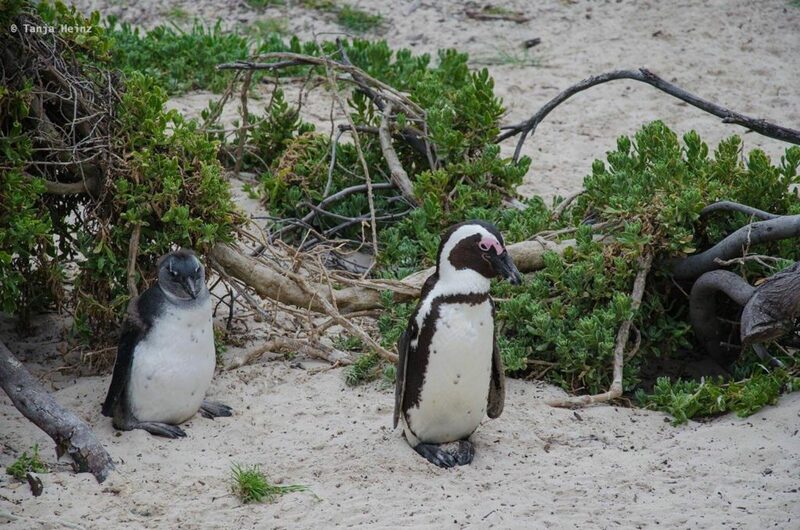 Therefore, it is very important to behave respectfully and considerately when encountering African penguins in their natural habitat (and of course in other places as well!). The global total population of African penguins is estimated to reach 50.000 individuals. However, the worldwide population continues to decline. 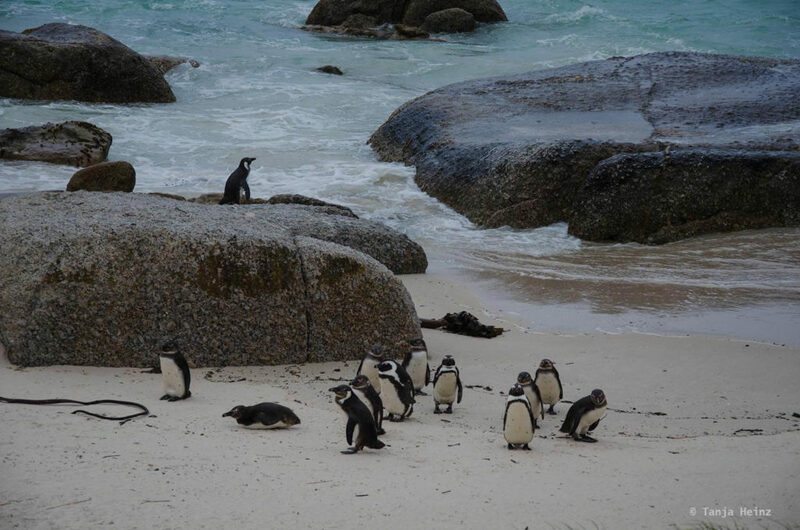 The African penguin population at the Boulders Beach in Simon’s Town is located on the Cape peninsula at False Bay, about 35 kilometers South from Cape Town. 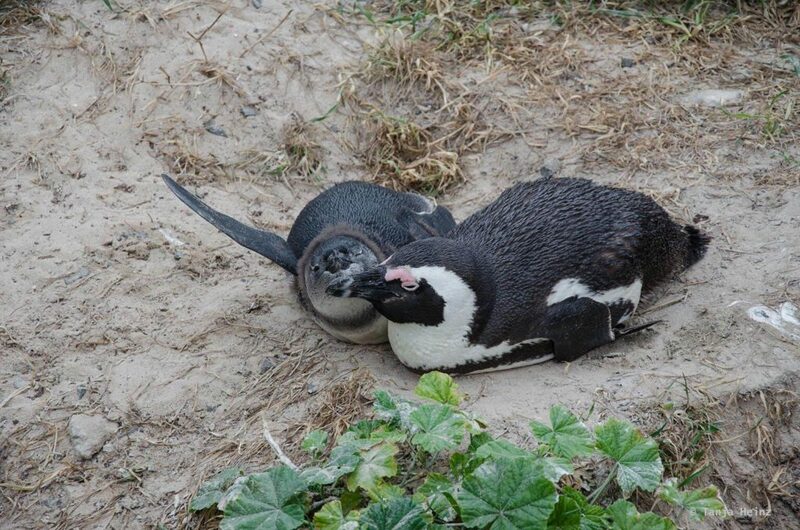 In 1985 more and more breeding pairs settled at the Boulders Beach. 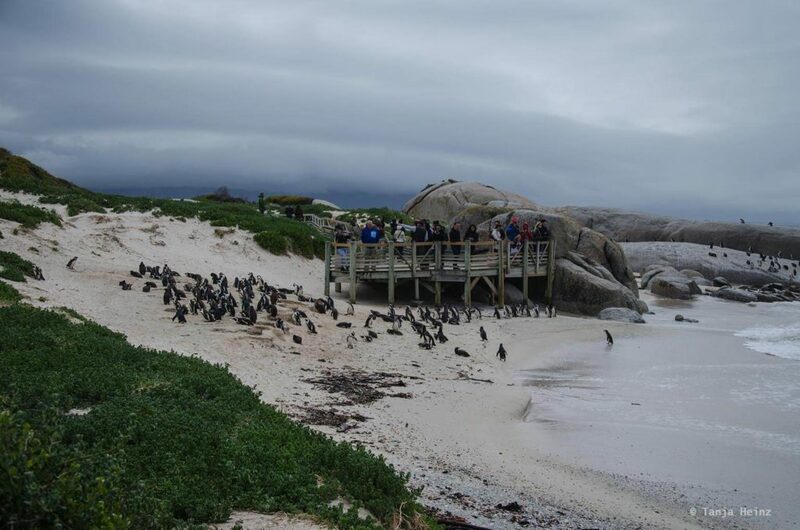 The population at the Boulders Beach since then is one of the few populations that is still growing in number. 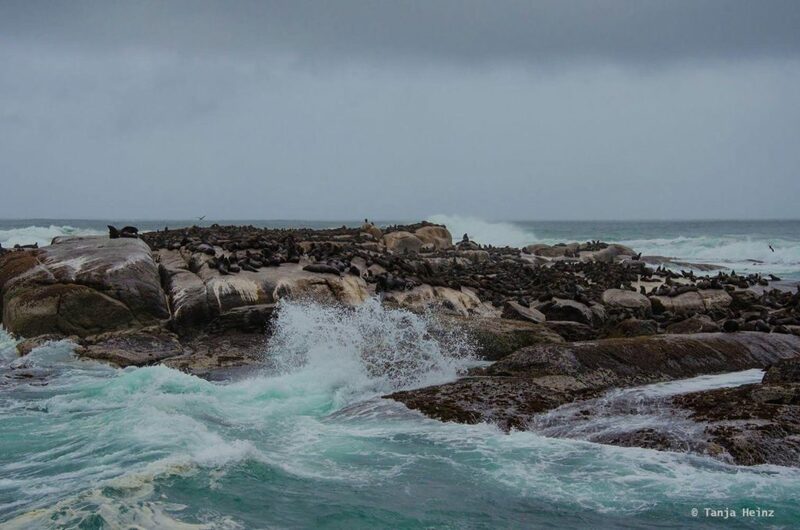 According to BirdLife, about 700 breeding pairs lived in 1997 at the Boulders Beach in Simon’s Town. 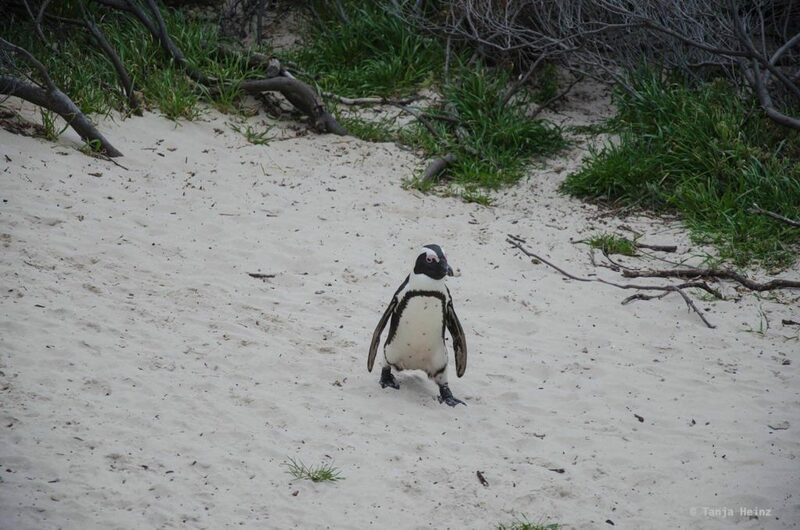 Nevertheless, penguins at the Boulders Beach are still exposed to many threats! 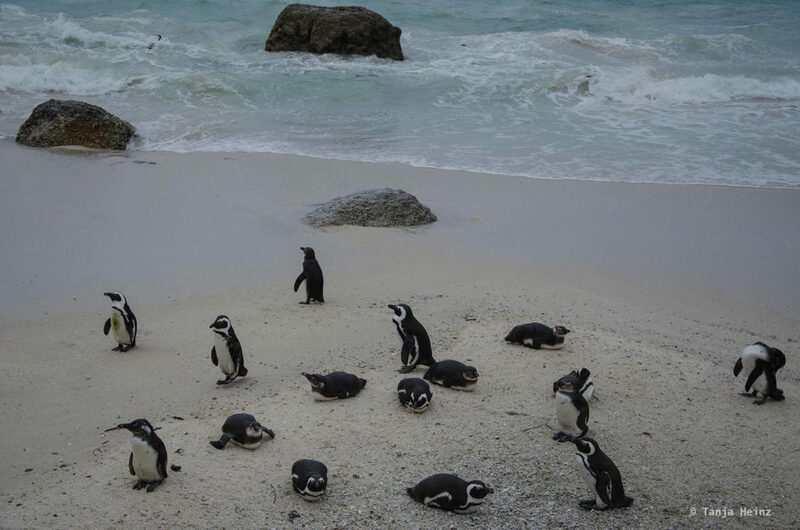 Tourism could be a problem as thousands of people visit the penguins in South Africa at the Boulders Beach each year. 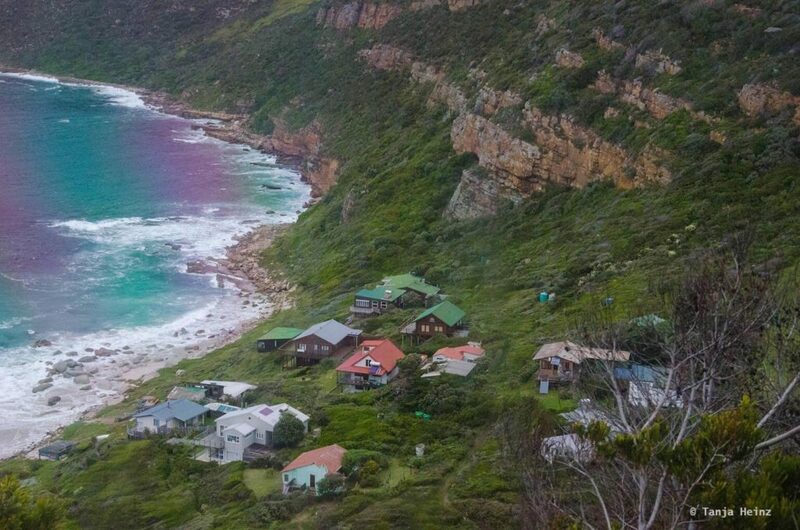 But the population in Simon’s Town as mentioned does not decline despite the high number of tourists. According to BirdLife, the organization conducts a study to evaluate the impact of this great number of visitors on the penguins. 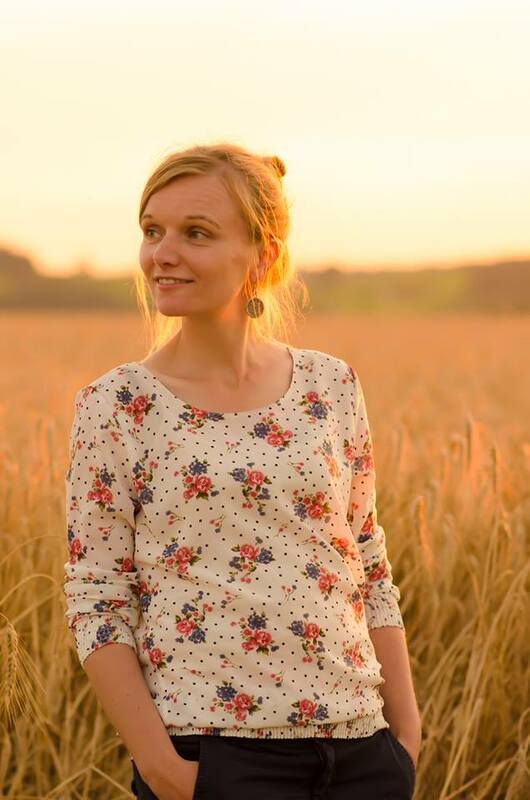 The organization adds that there is still a lot of potential to improve education. 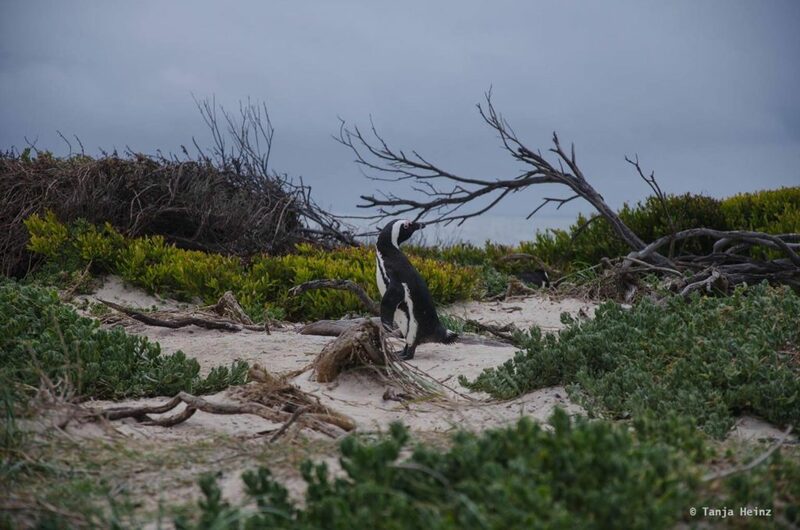 Another threat for the penguins in South Africa are predators like cats and genets and marine pollution. 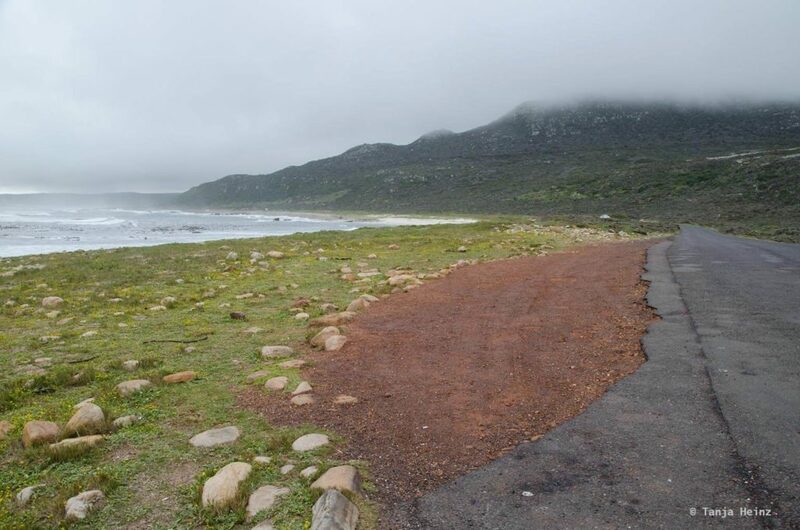 I visited the Boulders Beach with an organized tour from Cape Town. We stayed at the Boulders Beach in Simon’s Town for about an hour. 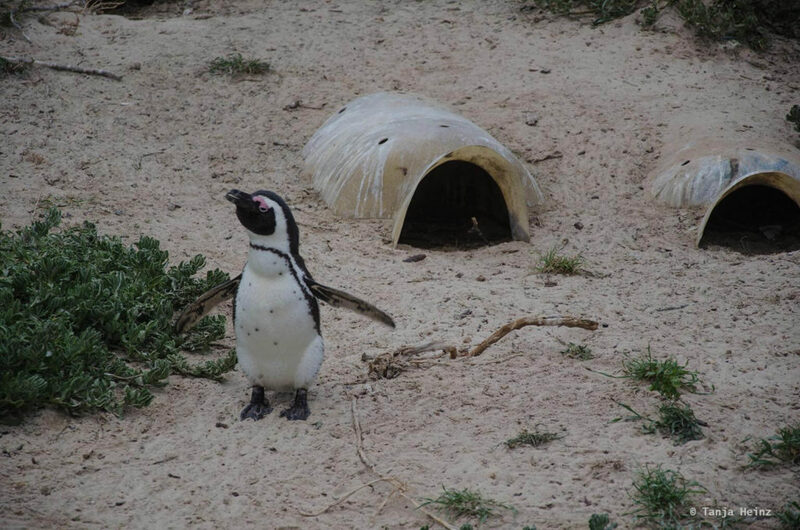 There could be much more done to educate visitors about African penguins. I did not see any person distrubing any penguin. However, there was no information about the biology of the penguins or which threats they are exposed to. Someone who wants to learn more about African penguins has to check the internet or other ressources. 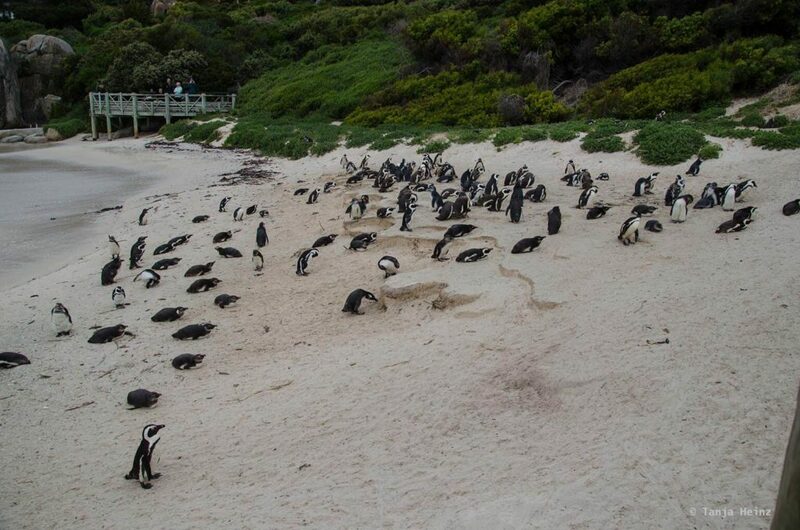 I used my time at the Boulders Beach to watch the African penguins from different observation platforms. Of course I took my camera with me. Penguins are a grateful motive for hobby photographers. They are very photogenic (they look cute on every photograph) and do not move so quickly. 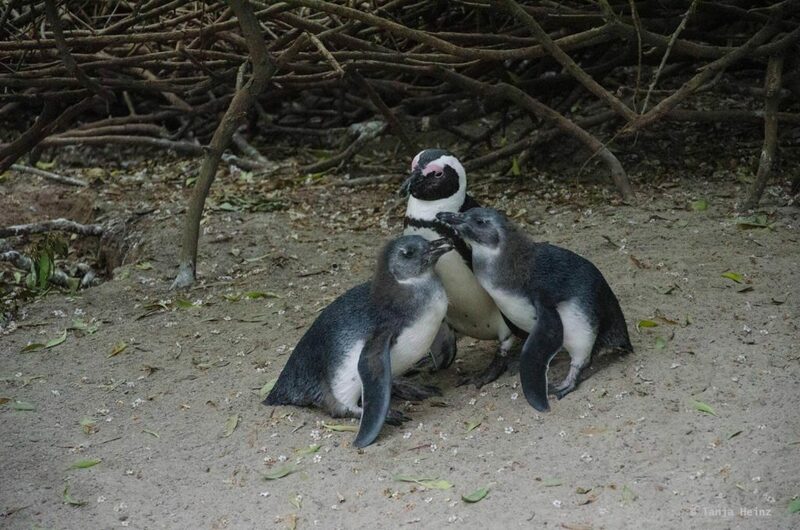 … while other penguin chicks were left alone by their parents in a crèche with other penguin chicks. 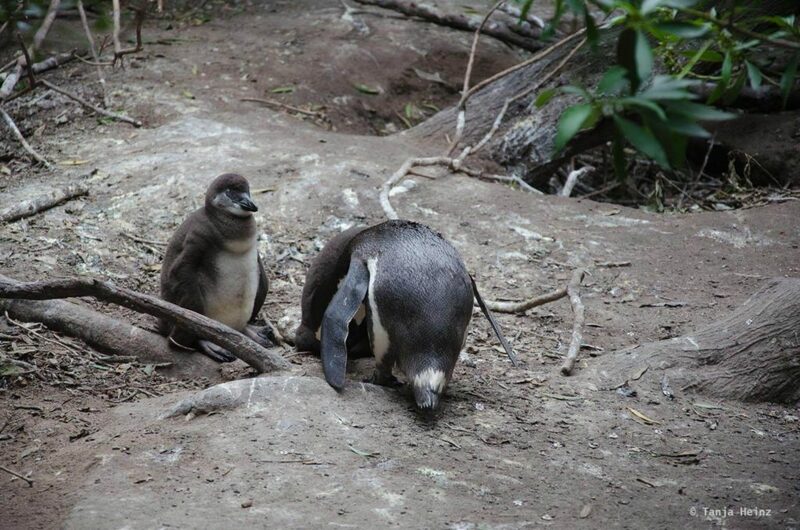 Other penguins miss a parent to clean their plumage. While small penguin chicks are rather in groups, some older, but still young penguins are resting alone. 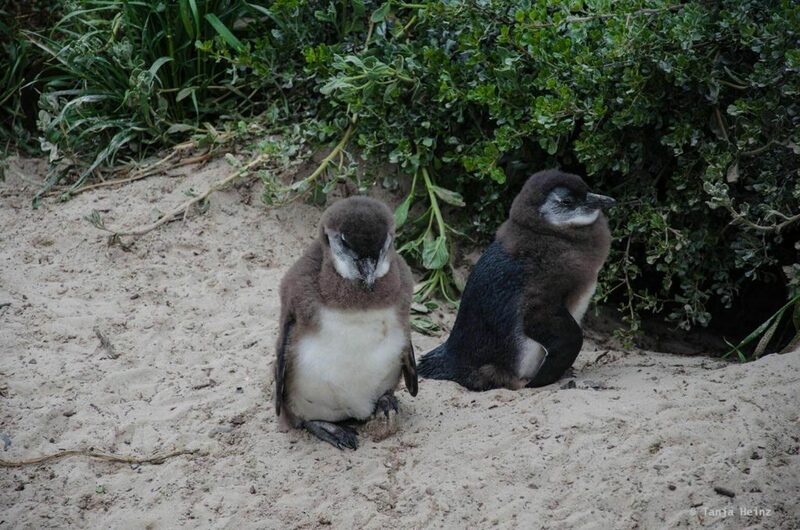 Like I mentioned before African penguins often raise two chicks. 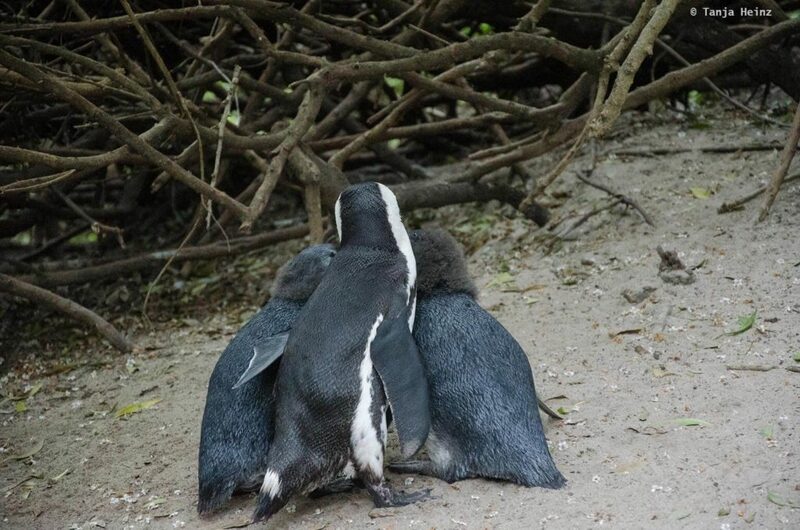 But this penguin was not the only penguin with two chicks. I could observe one penguin parent feeding two chicks. At first I could not see anything. 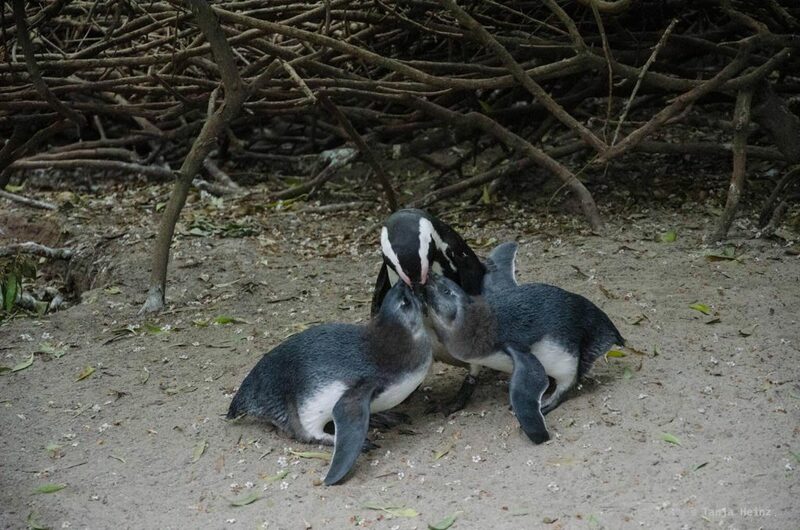 … and I observed the adult penguin feeding its chicks. However, as they frequently looked into my direction, I left again. I felt a little bit like an intruder disturbing their normal life in that moment. … but leave their offspring cleaning their plumage by itself. 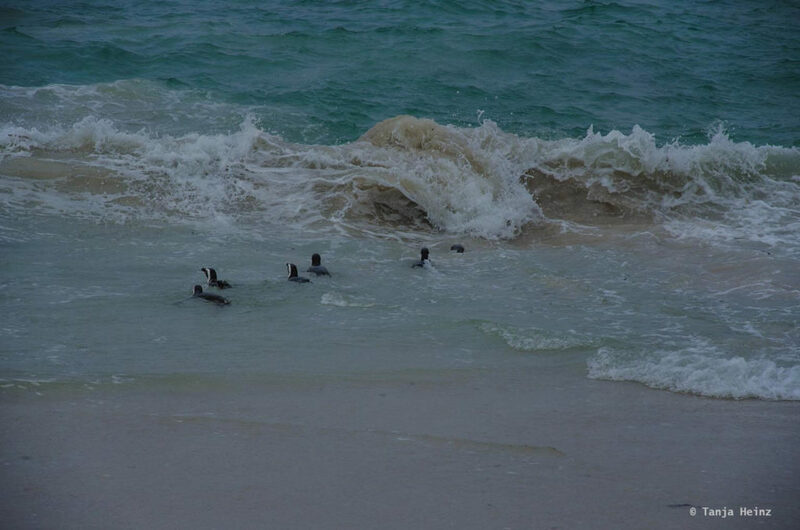 Most penguins I saw were on the beach. … and others just did nothing but relax. I also saw artifical nesting holes. … where I saw something I didn’t like. It is not necessarily the fault of tourists. The wind can distribute plastic trash from anywhere. 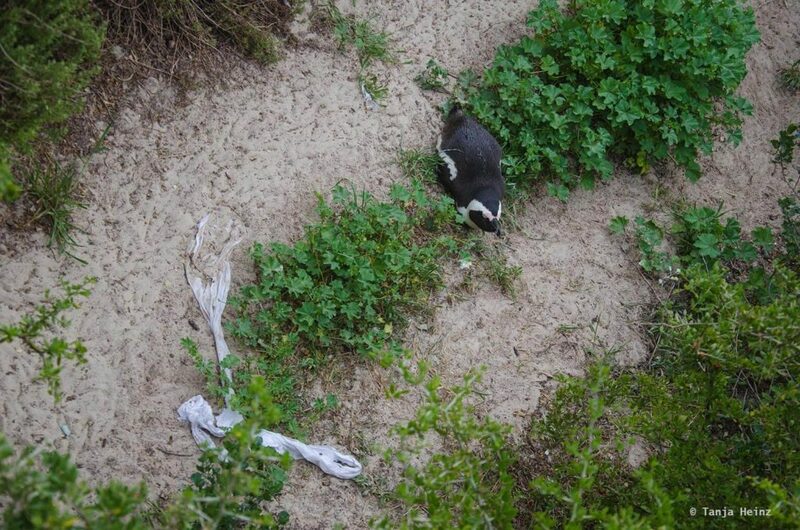 I hope that the penguin pouplation at the Boulders Beach in Simon’s Town continues to thrive. I’m curious to know about the study what impact tourists have on the penguins. 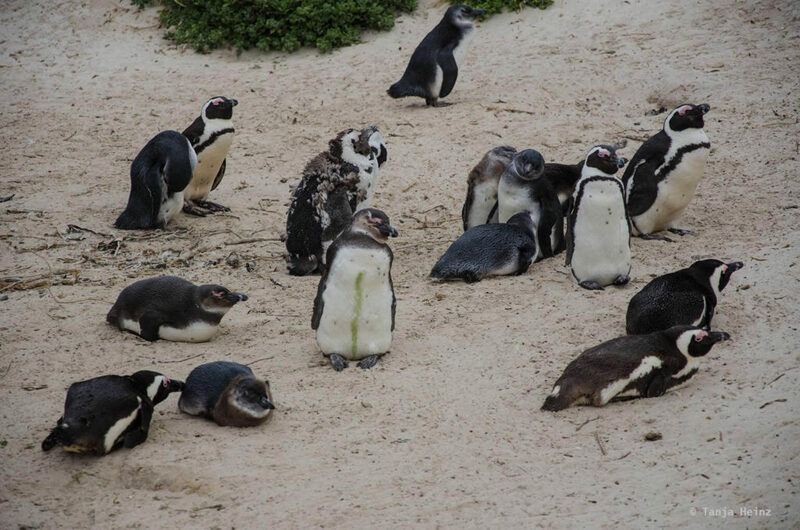 It was a very memorable moment for me and I hope that tourism rather protects than harm African penguins. Like I mentioned above I participated in an organized tour. 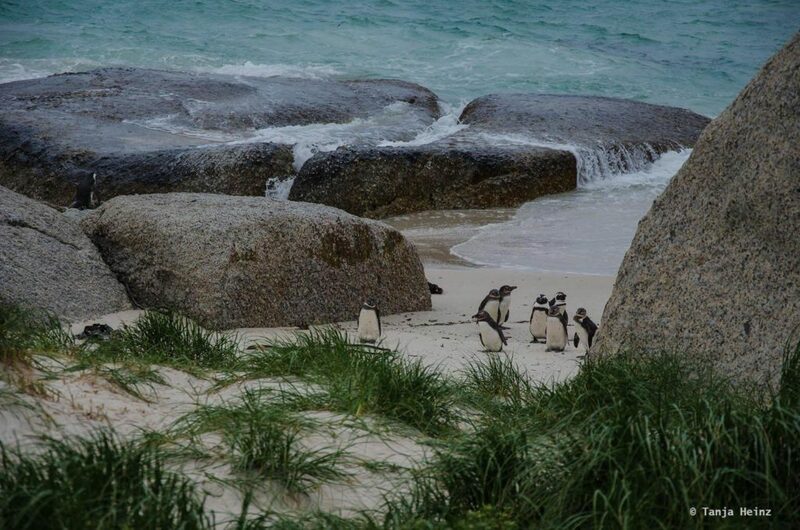 If I would have been alone I would have stayed longer at the Boulders Beach with the penguins. However, the day was short, and thus, we had to go. 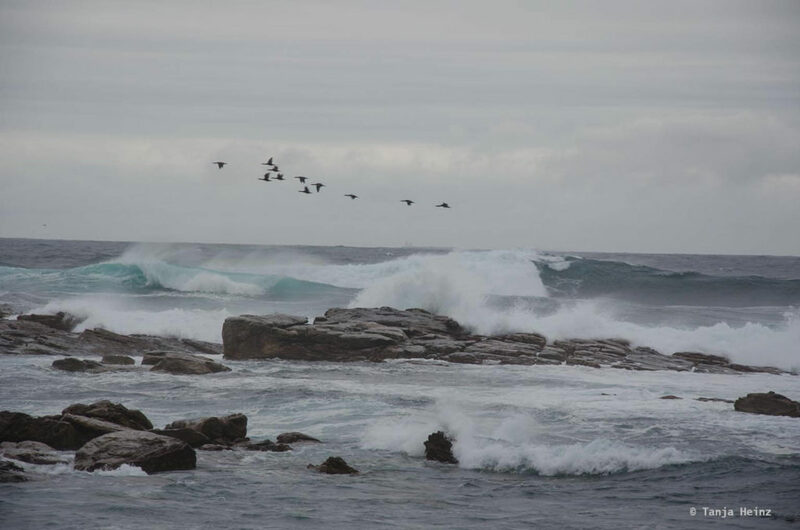 … where I joined a boat to see a colony of Cape fur seals on Duiker Island. 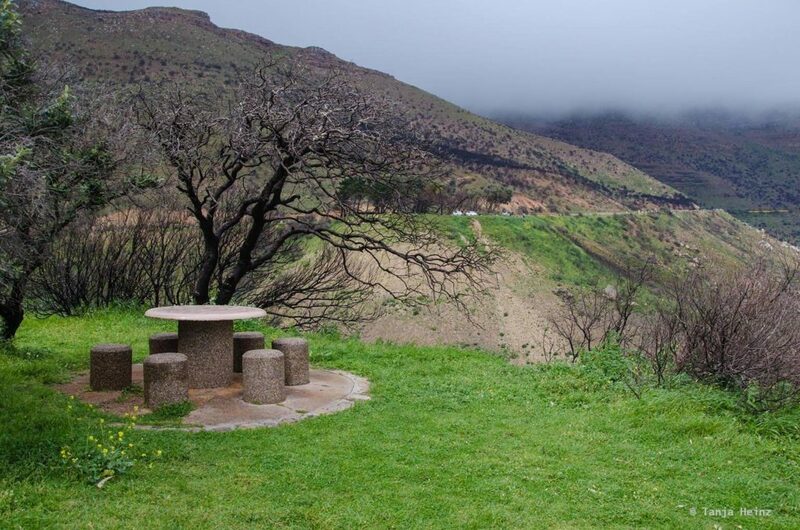 The weather was not good at all, but I very enjoyed the landscapes at the Chapman’s Peak Drive. The landscapes are just beautiful. It is also a good rest area for a picinic. We also passed by a village that was involved in whaling in the past. 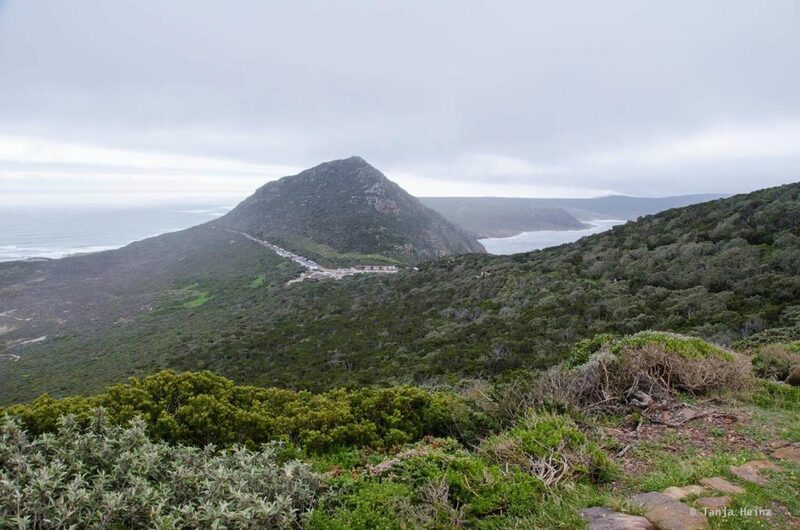 Very famous is the Cape Peninsula Nature Reserve. Of course we stopped in this area. We went to the most south westerly point of South Africa. The weather was windy and wet. But I liked it. I could have observed the waves of the sea for hours as usual. 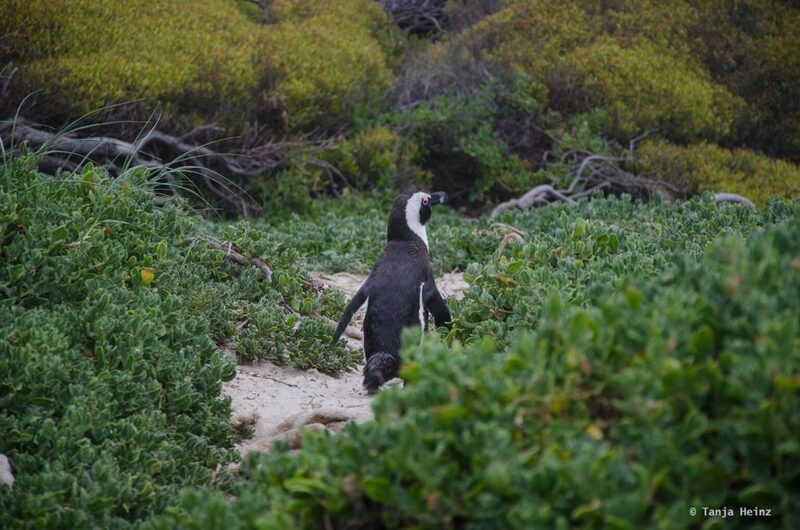 Observing African penguins can be perfectly combined with a trip to the Cape Peninsula Nature Reserve.